The senator said he had a "delightful" conversation with Trump’s conservative high-court nominee on Thursday. 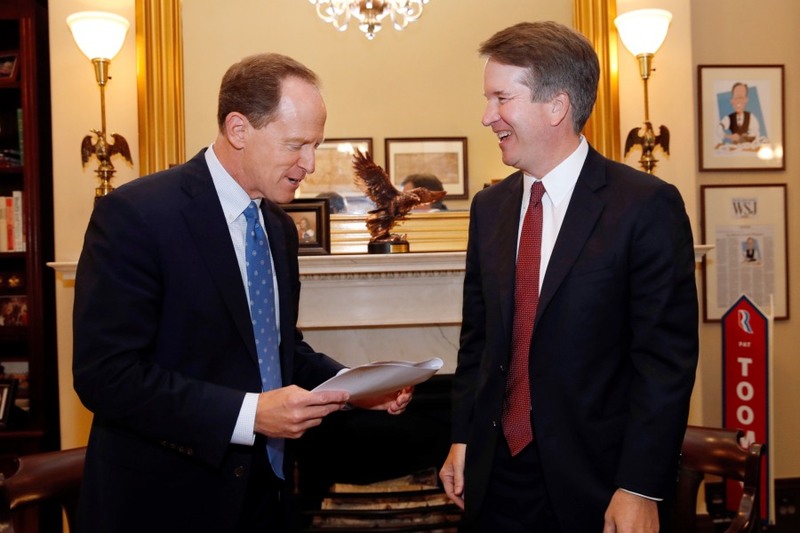 By Claire Sasko·	 7/27/2018, 11:05 a.m.
Republican U.S. Sen. Pat Toomey announced his support of U.S. Supreme Court nominee Brett Kavanaugh after the duo met in person on Thursday. Kavanaugh, a federal appeals court judge for the D.C. circuit, is President Donald Trump’s pick to replace Supreme Court Justice Anthony Kennedy, who often served as a key swing vote since 2006. Kavanaugh’s appointment would solidify a conservative majority on the U.S. Supreme Court for years to come. The pair met in Toomey’s D.C. office on Thursday morning. Toomey told reporters that they had a “delightful” conversation, which included a discussion of the limits of presidential power. The issue could find its way to the Supreme Court if it were to take a case regarding special counsel Robert Mueller’s probe into Russian interference in the 2016 election — and if Trump refused to be interviewed by Mueller. Despite question over how Kavanaugh might vote in such a case, Toomey said Kavanaugh was “very, very adamant” that “absolutely no one is above the law — and that includes the president,” according to The Morning Call. I hope my colleagues on both sides of the aisle will give Judge Kavanaugh fair consideration so that Republicans & Democrats can work together to confirm this highly qualified jurist. Democrats like U.S. Sen. Bob Casey and New Jersey Sen. Cory Booker have spoken out against Kavanaugh, arguing that his appointment could threaten Roe v. Wade as well as healthcare coverage under the Affordable Care Act. Casey has said that he would not support Trump’s nominee for Supreme Court justice no matter what — however, his office has also said that he would be willing to meet with Kavanaugh. No word yet on when and where that meeting might occur. Republicans and Democrats will continue to deliberate Kavanaugh’s nomination in the coming months. If all goes smoothly for the federal judge, a confirmation vote could come later this fall.